Today, I gave a hungry co-worker a hard-boiled egg; mentioning that I made it using a new recipe. “Hard-boiled eggs don’t have a recipe,” they laughed. While 5-years ago I would have agreed; I have marveled at the perfectness of each hard-boiled eggs that I have cooked for the past 5-years (following this recipe). Look closely at the photo below; how often do your eggs look like that? Before I began following that recipe, my answer was never. While extremely simple to make, hard-boiled eggs have two perennial problems. First, there is the green coating surround the yolk, which comes from overcooking. While green eggs are perfectly harmless to eat; it smells a bit like sulfur and usually turns slimy after a day or two in the refrigerator. Why is it so easy to overcook your eggs? Because adding eggs to boiling water requires a different time depending upon how many eggs you cook. Each additional egg delays the moment when the water comes back up to a boil. Getting the timing right is key; an issue that Chis Kimball solved 5 years ago. (and continues to solve using today’s recipe). The timing is for large eggs that are cold from the refrigerator. The recipe uses a steamer basket. But if you don’t have one, Chris Kimball says that you can place the eggs directly into the 1″ of water; using a spoon or tongs. The smaller amount of water will come back to a boil more quickly that a fuller pot; which will work on 6 or few eggs without altering the timing. If you are using a steamer basket, this recipe will work on any number of eggs that will fit into a single layer. The prior cooking technique I had been using for the past 5 years is given by Cook’s Country is here. Place steamer inside medium pan. Start time 6:00 AM. Ready at 6:30 AM. Add 1″ water to a medium-saucepan. Set over high burner and bring to a rolling boil; about 5 minutes. Carefully set eggs in steamer basket and move into saucepan with boiling water. Cover and reduce burner to medium-low; maintaining a boil; and cooking for 15 minutes. When eggs are almost done; combine 2-cups of ice cubes with 2-cups of told tap water into a medium bowl. When eggs are ready use tongs or slotted spoon to move eggs into the ice bath; allowing to stand for 10 minutes before peeling. I know that potatoes are scorned and avoided, and it’s always the same half-word offered as justification: “Carbs”. Personally, I love potatoes. They are my favorite side dish and Russets are my favorite variety, so right away I knew I was going to love this recipe. Pre-heating the baking sheet to 500-degrees did a great job at browning the potatoes’ crust, but without over cooking the interior. The interiors were creamy, but without being too mushy. Perfect mini-spuds; 4-stars. Perfectly cooked; crisp and browned on the outside. Tender on the inside. 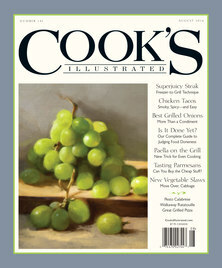 This is the last recipe from the January / February 2012 issue of Cook’s Illustrated. I left this for last not because I wasn’t excited to make them, but rather because I am not usually home for breakfast on the weekends. I naturally wake up by 6AM, and go to a cafe to blog and drink coffee while my family sleeps in until 9 or 10AM. 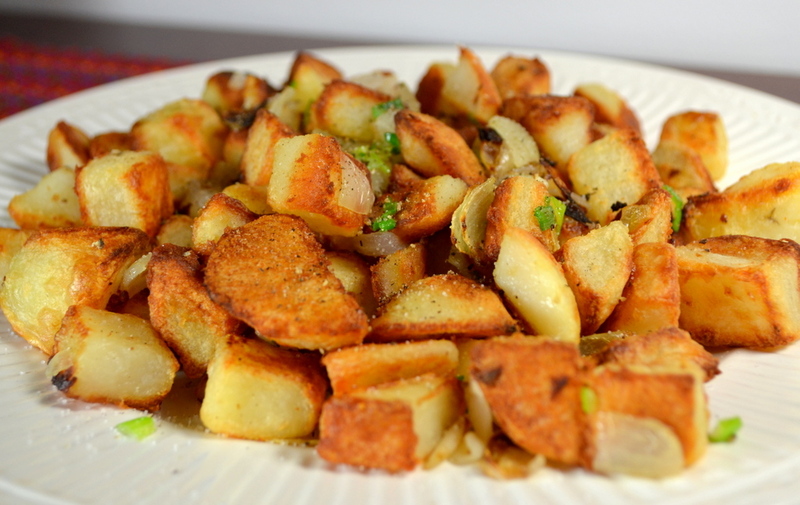 Chris Kimball’s original recipe made a huge amount of home fries. After all, the article was entitles “home fries for a crowd”. I cut the recipe down by one-third, and still ended up with leftovers. The recipe as I have described it below will easily serve 4 to 6 people as a side dish, but if you need to feed 6 to 8 people, then you can follow his original recipe. Chris Kimball almost never lines his baking sheet with aluminum foil, but I always do. Use heavy-duty foil for this recipe because of the scraping necessary in step 8 and 10. No matter how heavy-duty of a baking sheet you have, 500-degrees will make it warp with 100% certitude. Mine returned to its normal state within an hours after removing from the oven. I wouldn’t recommend this recipe if you only have a thin baking sheet. My supermarket was out of chives, so I substituted an equal amount of finely minced scallion greens. With this warm weather my own chives should be sprouting soon. Peel your potatoes and dice into 3/4″ pieces, and cut your 2 tablespoons of butter into 8 equal-sized pieces. Set an oven rack to the lowest position, and place a foil-lined rimmed baking sheet on the bottom rack. Pre-heat the oven and baking sheet to 500-degrees. Set a dutch oven over a high burner and boil 8 cups of water. Add diced potatoes and 1/3 teaspoon baking soda. Return water to a boil and cook for just 1 minute. Drain potatoes in a colander and immediately return potatoes to the dry Dutch oven; reduce burner to low heat. Cook for 2 minutes until all moisture has dried from the surface of the potatoes, shake the pot occasionally to ensure complete drying. Remove Dutch oven from burner, and add the pieces of butter, 1 teaspoons salt, and pinch of cayenne. Use a rubber spatula to mix for 30 seconds; the potatoes will become coated with a thick paste. Drizzle foil-lines rimmed baking sheet with 1-1/2 tablespoons vegetable oil, then evenly spread potatoes onto baking sheet. Bake at 500-degrees for 15 minutes. Meanwhile dice your onions into 1/2″ pieces and place in bowl. Add 3/4 tablespoon vegetable oil, and 1/3 teaspoon kosher salt. Toss to combine. Remove potatoes from oven after 15 minutes, then use a thin metal spatula to scrape and turn potatoes. Clear a 8″x5″ area in center of the baking sheet in which you should place your onion mixture. Bake for another 15 minutes at 500-degrees. Using the metal spatula to scrape and turn potatoes again, but this time mixing the onions and potatoes together. Bake for another 5 or 10 minutes until the potatoes become browned and the onions become soft and are beginning to brown. Mix in minced chives and adjust with salt and pepper according to taste. Serve immediately. I absolutely love fresh avocados; so I added these to my “to do” list a few months ago when the recipe made the rounds on TasteSpotting and FoodGawker. When I read the recipe in detail they seemed overly sweet, so I cut back on the sugar. Unfortunately, they were still too sweet for my taste. While my kids loved the sweetness, they didn’t care for the avocado. I’d give them 3-stars, because the lime was over-powering and didn’t let me enjoy the avocado. The lime glaze was heavenly; only the lime mixed into the filling needs to be scaled back. Overly sweet; not just an adult version of a Pop Tart. The boys loved the idea of making home-made Pop Tarts, but next time I’ll have to stick to a more kid-friendly fruit; cherry, strawberry, orange. Cost: $5 for 4 large pastries. Start time 11:00 AM. Lunch: 1:20 PM. Cut 2 sticks of butter into 1/2″ cubes, then chill in freezer for 15 minutes. Add 2 cups flour, 3 tablespoons granulated sugar, and 1/2 teaspoons salt in the bowl of a food processor fitted with a steel blade. Pulse a few times to combine. Add the cubed butter and pulse for 10 one-second pulses until the mixture resembles a coarse meal with bits of butter sprinkled throughout. With the processor running, add the cold water and processing until dough forms. Remove to a floured surface and knead for 10 seconds and form a smooth, uniform ball. Separate into two evenly sized balls, wrap with plastic wrap and refrigerate for at least one hour or up to overnight. Preheat the oven to 350° and remove your chilled dough balls to a well-floured work surface. Roll each piece of dough out into an 8″ x 12″ rectangle; about 1/4″ thick. Cut out 16 rectangles measuring 3″ x 4″ each. You may need to assemble your scraps and re-roll your dough a few times to get even pieces. If the dough becomes too hard to work with stick your cut pieces of dough back in the refrigerator for 30 minutes to be sure that they’re chilled through once you assemble and bake the tarts. Lay your pieces onto parchment-lined baking sheets, cover with plastic wrap and set aside at room temperature. Peel, pit and chop your avocados into a small dice and place in large bowl. Add the lime juice and sugar, and mash into a chunky consistency. 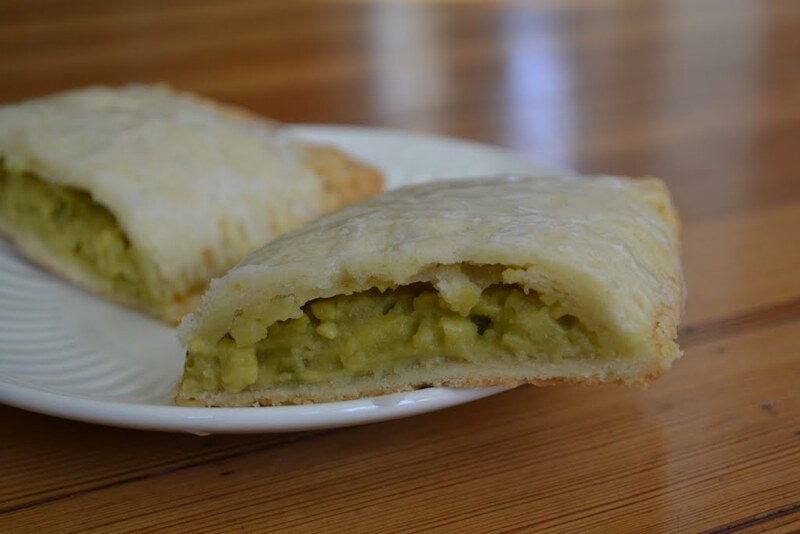 Spoon the avocado mixture onto 4 pieces of cut pastry. Use your fingers to pre-form the second rectangle of pastry so that it is slightly cupped. Carefully place on top of each mound of avocado and use a fork to press the top and bottom of each pastry together down all four sides. Using fork; gently pierce the top of each pastry several times to allow steam to vent. Bake for 28-32 minutes or until the edges are just turning a lightly, golden brown. Remove the baked tarts to cool for 10 minutes. Meanwhile, prepare your glaze by whisking the confectioners’ sugar and lime juice together in a small bowl. Finish by glazing the top of each with the lime glaze. Part of my weekly ritual involves going to Panera Bread and blogging in the early morning hours before my two boys wake up on Saturday or Sunday. 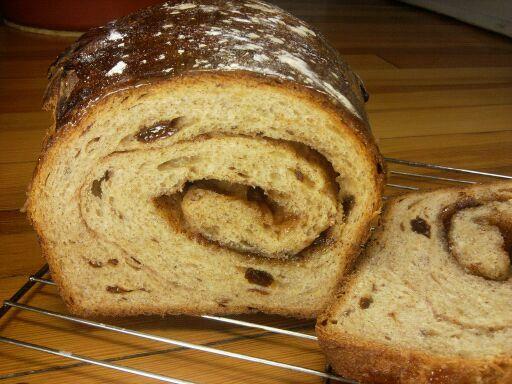 With every coffee refill, I pass by a beautiful Cinnamon Raisin loaf. The only problem is that the $4.50 price tag seems absurd. And since Chris Kimball doesn’t have a recipe, I had to resort to Martha Stewart. True to form; Martha’s recipe is basic and decent but is less fool-proof, omitting details that are “common sense” (at least to Martha Stewart). It also didn’t have enough raisins or cinnamon, plus I substituted 2 teaspoons of vanilla extract. Can be messy if the filling oozes into the oven. I first made this loaf one day before Huricanne Irene; as part of our “weathering the storm provisions”. The recipe includes my improvements; which I give 4-stars. My 12-year-old son called it the best bread I’ve ever made. No matter what you do, there is a danger that the filling will overflow. So put a foil-lined baking sheet pan below the loaf pan for easy clean up. As with most of my bread, I made a 1/4″-deep slice using a serrated knife down the top of the loaf. I make this release cut to promote a higher rise during the fist few minutes of baking. Unfortunately, my release cut sliced into the filling and let it ooze from the top during baking. In the future I will not make any release cuts. The original recipe called for 45 minutes in a 425-degree oven. After just 35 minutes the crust was thick and hard, but not burnt. I had tented the loaf after 15 minutes. To rectify the problem I reduce the over temperate to 375-degrees after 5 minutes; enough time to give the loaf an “over spring” but low enough keep the crust from becoming too tough. If desired, measure out your 1/4-cup of sugar of which you can mix about 1 teaspoon in with your hydrating yeast. This will give the yeast additional food to give it a nice kick start. Microwave milk in 2-cup Pyrex measuring cup for 30 seconds to 105-degrees. Whisk in yeast and allow to hydrate for 5 minutes, after which you should see some bubbling. Add flour, butter, sugar, egg, salt and cinnamon to bowl of standing mixer equipped with dough hook attachment. Turn mixer to low (2 on a kitchen-aide) and slowly add yeast mixture. When ingredients become incorporated, increase mixer speed to 4 and mix for 3 minutes until the dough is mostly smooth and clears the sides of the bowl. Slowly add the raisins until they become incorporated. Increase to 6 and continue to knead for another 3 minutes. The dough should be smooth and the raisins are evenly distributed. Spray a glass bowl and rubber spatula with non-stick cooking spray. Put the dough in the bowl and turn once to coat lightly with oil. Cover with plastic wrap and let rise in a warm place for 1 hour until doubled in size. In winter, you’ll have to use your warmed, but turned off oven to help. Using a greased spatula, fold the dough over onto itself; rotate bowl quarter turn and fold again. Rotate bowl again and fold twice more (a total of 4 folds). Cover with plastic wrap and let rise another 40 minutes. Spray a 9″x5″ loaf pan with nonstick cooking spray. To make the filling, combined sugar, cinnamon, vanilla and water in a small bowl. Turn out dough onto a lightly floured work surface. Use a rolling pin to roll into a 10″x12″ rectangle. Brush lightly with beaten egg, leaving a thin border around the edges. Sprinkle the entire surface (less borders) evenly with cinnamon-sugar mixture. Fold in the edges along the long sides of the dough about 1″; resulting in a 10″-square. Beginning with unfolded ends (the folds will form the loaf ends), roll the dough up into a tight spiral log, gently pressing as you go. Pinch the seam to close, and place seam side-down in the prepared loaf pan. Cover loosely with plastic wrap and allow to rise for another 30 to 40 minutes or until the dough rises just above the edge of the pan. Meanwhile, preheat your oven to 425-degrees. Place a foil-lined baking sheet on the lower shelf to catch any drippings. After the loaf has risen, brush the top of the loaf lightly with the remaining beaten egg. Bake at 425-degrees for 5 minutes, then reduce to 375-degrees without opening the oven. Continue baking for another 35 minutes; rotating the pan after 10 minutes. Tent loosely with foil when the top crust reaches your desired darkness (I tented mine about halfway through baking). The loaf will be done when the internal temparture reaches 195-degrees. Cool the loaf in the pan for 5 minutes. Turn out the loaf and allow to cool on a wire rack for 1-1/2 to 2 hours before slicing. Dust lightly with confectioners sugar. The last time I made these Cinnamon Buns was December 29, 2009; two days before I started this blog; and my oldest son has been begging me to make them again. The dough is rich and buttery, and the cream cheese frosting is sweet, but more flavorful than a standard sugar-only glaze. It’s a bold claim for Cook’s Country to call these the ultimate cinnamon buns. While they are rich and delicious, the recipe has a fundamental problem that has occurred each of the five times I’ve made this recipe. Chris Kimball claims that the butter and cinnamon sugar are “… baked together, [and] turned into a truly rich, gooey filling”. But the truth is that the gooey filling oozes to the bottom of the pan, and after cooling forms a hard, unpleasant, glass-like coating. If left too long to harden, it will permanently attach the buns to the aluminum foil used in baking. I haven’t found a solution prevent the formation of the epoxy-like coating. However, I have come up with a hard-and-fast rule to mitigate the damage: always remove the buns from the foil no more than 20 minutes after removing from the oven. Waiting the designated 30-minutes before removing from the foil will make a disaster of the already difficult process of removing the buns from the foil. 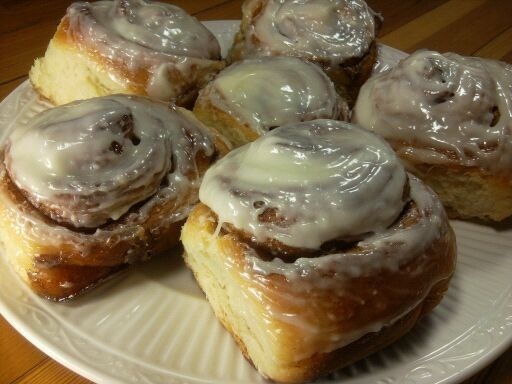 Originally the recipe calls for diving the rolls into 8 pieces, but the cinnamon buns are too big. Nobody would eat a whole bun, but rather always cut them in half. So instead I divide into 12 pieces, which makes a much more manageable size. The recipe calls for a 13″ x 9″ pan size. In my kitchen I have two different Pyrex casserole dishes to choose from, so I had to choose the 14″x10″. I’m not sure if this could have impacted the filling. I strongly recommend using heavy-duty aluminum foil because of the filling problem described above. There are a few other recipes that I have not tried. They include these Yeasted Cinnamon Buns and also these non-yeasted rolls. Cost: $3 for 12 cinnamon buns. Start 5 hours before serving. If making ahead, restart 2 hours before breakfast. However, the recipe only requires 30 minutes of effort. Set eggs and 2 sticks of butter out for 30 minutes to warm to room temperature. Cut butter into 16 equal pieces. Adjust your oven rack to middle position. Preheat oven to 200 degrees, then it shut off. This will provide a warm environment for the dough to rise. Line a large Pyrex casserole dish with heavy-duty aluminum foil, allowing excess to hang over the edges. Apply some butter to foil. Heat milk in 2-cup Pyrex measuring cup in microwave for 50 seconds to 110 degrees. Whisk yeast into milk and let hydrate for 5 minutes, then whisk in eggs (still in measuring cup). Add flour, cornstarch, sugar, and salt to bowl of a standing mixer. Attach the dough hook. Turn mixer on low (2 on a kitchen-aide), and slowly pour milk mixture in a steady stream. Mix for 1 minute until dough comes together. Increase mixer speed to medium (4 on a kitchen-aide). One piece at a time, add butter and mix for 10 minutes. The dough should be smooth and come away from sides of bowl. If the dough is still wet and sticky, one tablespoon of flour at a time until the dough releases from the sides of the bowl. Turn dough out onto clean surface and knead to form a smooth, round ball. Transfer dough to large bowl sprayed with non-stick cooking spray. Cover the dough with plastic wrap and put in warm, but turned-off, oven. Let dough rise for 45 minutes until it doubles in size. After 40 minutes, combine brown sugar, cinnamon, and salt in small bowl. Lightly flour a surface, and turn out dough, and roll dough into an 18″ square. Spread the 4 tablespoons of softened butter over the top surface of the dough, but leave a 1/2″ border around edges. Evenly sprinkle the sugar mixture over the buttered dough, and gently press down on the sugar so that it sticks to the dough. Starting with the closest edge, tightly roll the dough into a cylinder. Pinch the seam to seal and turn so that the seam side is down. Use a knife to cut in half, then in half again; then each piece into thirds, yielding 12 rolls. Place the pieces, cut-side facing upward, into prepared pan and cover with plastic wrap. If you plan to finish them tomorrow, refrigerate now for up to 24 hours. If you plan to continue today, then let them rise near the oven (or other warm spot) for 1 hour. If you refrigerated the dough, let it sit at room temperature for 1 hour before baking. After 30 minutes begin preheating the oven to 350 degrees. Add the softened cream cheese, milk, vanilla, and confectioners sugar to a medium bowl. Using a fork, mix together until smooth. Remove the plastic wrap and bake for 27 to 30 minutes. The buns will be golden brown and filling will have melted. Transfer to a wire rack, and evenly apply 1/2 cup of glaze to the tops of the buns. This will be the “primer coat”. Allow to cool for 20 minutes, then use the foil overhang to lift the buns from the pan. After 10 more minutes top with remaining glaze, and serve. 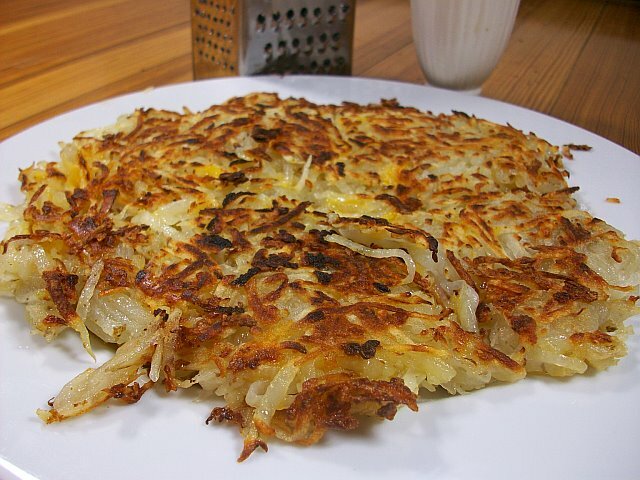 There was a period over several months when I ate hash browns twice a day; for breakfast and dinner. No, I am not crazy (at least not for hash browns). I was biking across the altiplano of Bolivia. It was several day’s ride between towns, and the only food available was potatoes. But not just potatoes; the world’s most bountiful variety of tubers. With hundreds of varieties of potatoes, every color in the rainbow, every shape imaginable; I don’t think I ate the same type twice. But enough was enough, after I road down the back side of the Andes into the Chaco desert of Paraguay, I swore I would never eat hash browns again. Now, more than 10 years later I am going to break my promise to myself and make Chris Kimball’s Classic Hash Browns. Wringing before cooking makes for better taste and texture. Classic recipe is here, but there are other variations here. So what makes this recipe different is the technique of drying the potatoes. Place in clean cloth towel and twist until they have released their water. Here I mixed with 2 tablespoons of grated onion and 1/4 cup of cheddar cheese. Descending the back side of Andes into Chaco desert of Paraguay. Bought for less than $1 in Bolivian market. Hotel made of salt blocks near Uyuni, Bolivia. Stark landscape of the Bolivian Altiplano. Look carefully, those are Flamingos at at 15,000ft. Rode with swiss biker, Judith, for a few days. Technically the tropics, but who would have guessed. Bridge that washed out in floods a few days after I crossed it. 3-1/2 stars. Overall, these rate better than my Bolivian Hash Browns; though how many people have eaten purple Hash Browns? Started: 8:30 AM. Ready: 9:00 AM.